Purpose: Chocolate has been used for many things, however, never as an acid neutralizer. However, in this experiment, Scientific AmeriKen, will examine the properties of chocolate to determine whether it possesses the ability to neutralize acids. Hypothesis: In order to neutralize and acid, chocolate would need to be slightly basic. 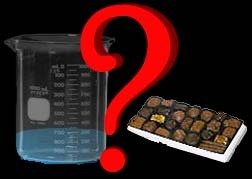 However, it is the hypothesis of this experiment that Chocolate will not neutralize an acid because it does not possess the qualities which would meet the requirement. The belief is that chocolate is composed primarily of sugar which will not neutralize the acid. Equipment: Used in this experiment was Acetic acid (vinegar), Chocolate, Test Tubes (or any other glasswear works), a syring, and litmus paper. acid seemingly has a pH of roughly 4.
acetic acid mixture seemingly has a pH of 6. Conclusion: Based on the results, it seems as though the chocolate neutralized the acid somewhat. Although it was quite difficult to determine the actual pH as none of the colors seem to match, it was apparent that the two strips were of seperate colors. In addition, because the chocolate/vinegar mix turned the strip more white as opposed to more red (lower pH higher acidity), it is believed that in fact the solution became less acidic.